These wonderful cookies are soft, moist, chewy... and spicy! Their secret? Ground black pepper, which gives their flavor delicious "bite" right at the end. Fresh-grated ginger and crystallized ginger add their own distinctive sweet-hot flavors. Thanks to Pies a la Mode, a bakery in Falmouth, Massachusetts, for the cookies that inspired this recipe. 8 mins. to 14 mins. 23 mins. to 39 mins. In a large mixing bowl, beat together the butter, sugar, salt, and baking soda until they're well-combined. Beat in the egg, and then the molasses, scraping the sides and bottom of the bowl to blend in any sticky residue. Add the flour, oats, crystallized ginger, fresh ginger, spices, and espresso powder. Mix just until thoroughly combined. Scoop the sticky dough into 1 1/2" balls; a tablespoon cookie scoop works well here. Roll the balls in sugar (either granulated or coarse), if desired. This is easily done by sprinkling the sugar into an 8" cake pan, and dropping the sticky dough into the pan. Shake the pan to coat the dough balls with sugar. Space the cookies on the prepared baking sheets, leaving about 2" between them. 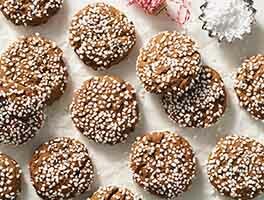 Bake the cookies for 8 to 14 minutes; bake for the shorter amount of time on a dark cookie sheet without parchment; the longer time if you've lined your baking sheet with parchment. The centers will look soft and puffy; that's OK. Cookies baked for the shorter amount of time will be VERY soft; bake them longer for a firmer cookie. Remove them from the oven, and cool right on the pan; or transfer to a rack to cool. 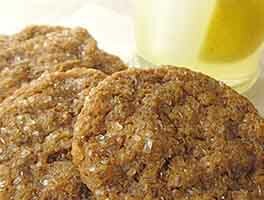 To maintain soft texture, store at room temperature once cookies are completely cool. Worth every extra minute in prep. Delicious! So delicious! I did not have any crystallized ginger on hand so I skipped it and used a little more fresh ginger to make up for it. I also used white pepper in the place of black pepper for a bit milder spice. Both the flavor and the texture turned out exactly as I hoped! 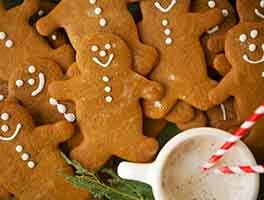 Every year I can't wait until the holidays to bring out this recipe! I try to make different cookies each week during the holidays and I always make these first because I love them so much. 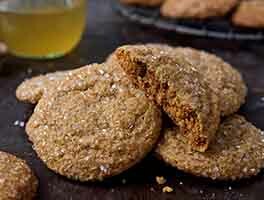 I never liked ginger very much, so the first few times I left out the crystallized ginger but I found that these cookies taught me to love ginger and now I add the crystallized ginger! My husband made a face when I told them what they were but now he loves them too....these cookies can concert anyone! SO good. I skipped both the crystallized ginger and rolling in sugar, and tripled the fresh ginger -- I always keep a tube of pureed ginger on hand, so it was an easy swap. Really gives it a nice zing, as does the black pepper! I don't think cookies to be too sweet, so these are perfect. Will definitely make again! Love you, KAF! I love these cookies! And so did everyone who received them this year. 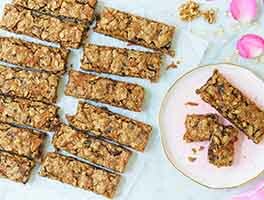 The texture is delightfully chewy and I love the kick of ginger. I made these more than anything else this Christmas! 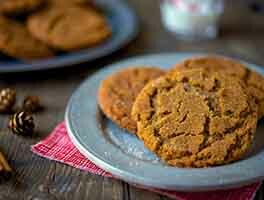 This is hands down the BEST molasses cookie recipe I've tried and I've made many. My husband brought some to work and all his co workers requested for me to make more. I love that they're not cake-y, like many cookies i've made. The consistency is chewy in the middle and crispy on the edges. The name of these cookies never sounded appealing to me so it took me awhile to make them, but I'm glad I did! This recipe is another winner. It's all about the two gingers and black pepper. I always use KAF sparking white sugar. It makes a nice big cookie and they were talked about for several day. Thank you KAF. Always a hit! I usually skip the sugar rolling step. They are a delicious and chewy balance of not too sweet and spicy enough to keep things interesting. I also often use whole grain pastry flour, which works wonderfully as well!